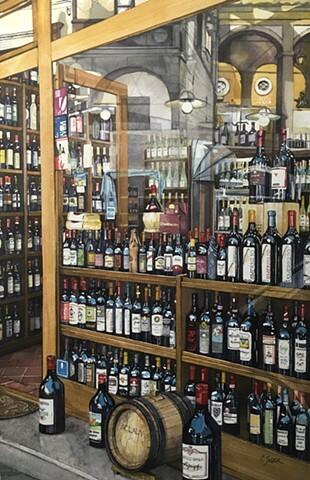 I took this image of a little wine shop in Cortona, Italy. It took me years to get the nerve to paint it, as it felt like such a daunting task! Overall, I really enjoyed painting it, and had fun with the reflections and labels. There was a lot of creative editing for this piece and I'm satisfied with the final result. This painting was chosen to be part of the Open Water 2016 watercolour show. It was an honour to have a piece chosen for that show.